This map displays the fishing grounds of B.C. fisheries that are ranked green or yellow by SeaChoice. When buying your next seafood meal choose one of these sustainable options to support healthy oceans and local fishermen. Best Choice (Green): This species is currently fished/harvested sustainably and represents a best choice. Enjoy green choices in moderation while supporting responsible fishing and coastal livelihoods. Some Concerns (Yellow): Seafood that should be consumed infrequently, or when a green choice is not available. There are conservation concerns with the current populations or practices in this fishery. Avoid (Red): Do not purchase these fish until the industry improves their practices so the populations recover. Red-listed seafood comes from sources that have a combination of problems – habitat damage, by-catch, poor management, low populations, can be easily harmed by fishing or may be listed by governments as Endangered. 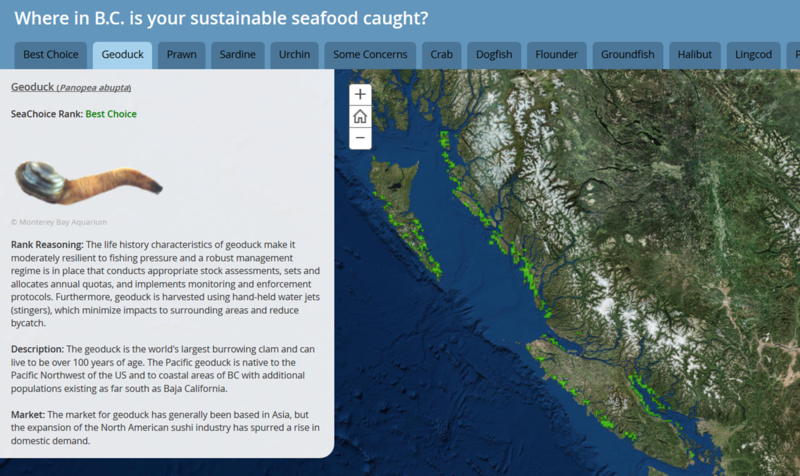 British Columbia’s local waters provide some of the most sustainable and healthiest seafood – use this map to find out where your sustainable seafood is being caught! * The SeaChoice Program is operated by Canadian Parks and Wilderness Society BC, David Suzuki Foundation, Ecology Action Centre, and Living Oceans Society.